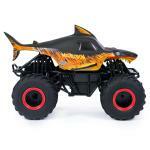 From the depths of the prehistoric ocean rises the all-new, official Monster Jam 1:24 scale, Fire & Ice Megalodon RC! This powerful predator lashes about to perform epic stunts, crazy crashes and brutal bashes!! 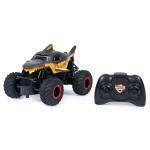 Featuring 2.4 GHz, you can race up to 6 of the most recognizable Monster Jam trucks at a time! Now it's even easier to host your own high-flying Monster Jam rally with your friends! Featuring a range of up to 250 ft., this prehistoric shark can travel farther in search of puny prey to pulverize! Nothing will stop it from dominating the Monster Jam circuit! Authentically styled, this 1:24 scale Megalodon remote control comes with official BKT Tires and a look-alike chassis, making sure this giant shark always delivers big fun! 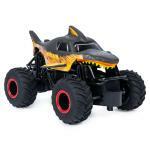 The all-new Fire & Ice Megalodon RC is like driving the real thing! Catch this prehistoric beast and perform high-flying, gravity defying stunts like big, donuts, cyclones and more! You've never been this close to the action than with the all-new, official Monster Jam 1:24 scale, special edition Fire & Ice Megalodon RC! 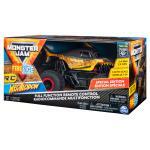 OFFICIAL FIRE & ICE MEGALODON: Your 1:24 scale Fire & Ice Megalodon is an official Monster Jam truck! It comes complete with official sponsor BKT Tires and a look-alike chassis making your monster truck look like the real thing! 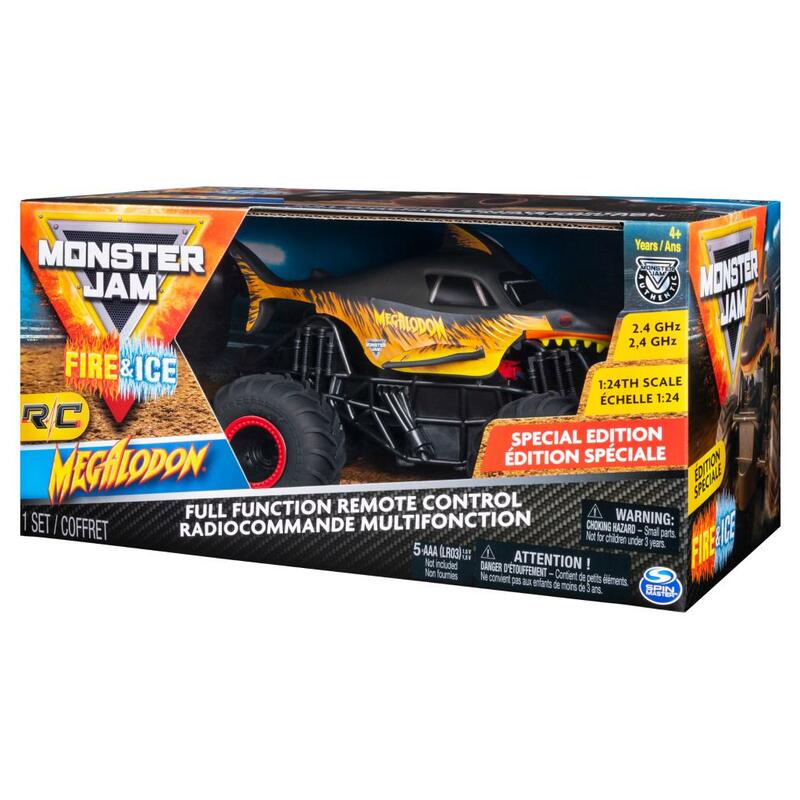 EXCLUSIVE SPECIAL EDITION: This 1:24 scale Fire & Ice Megalodon is an exclusive special edition of the famous Monster Jam monster truck! NEW & IMPROVED TECH: For the first time ever, 2.4GHz allows you to race up to 6 Monster Jam trucks at a time! 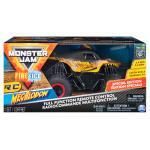 Now it's even easier to host your own Monster Jam rally with your friends! 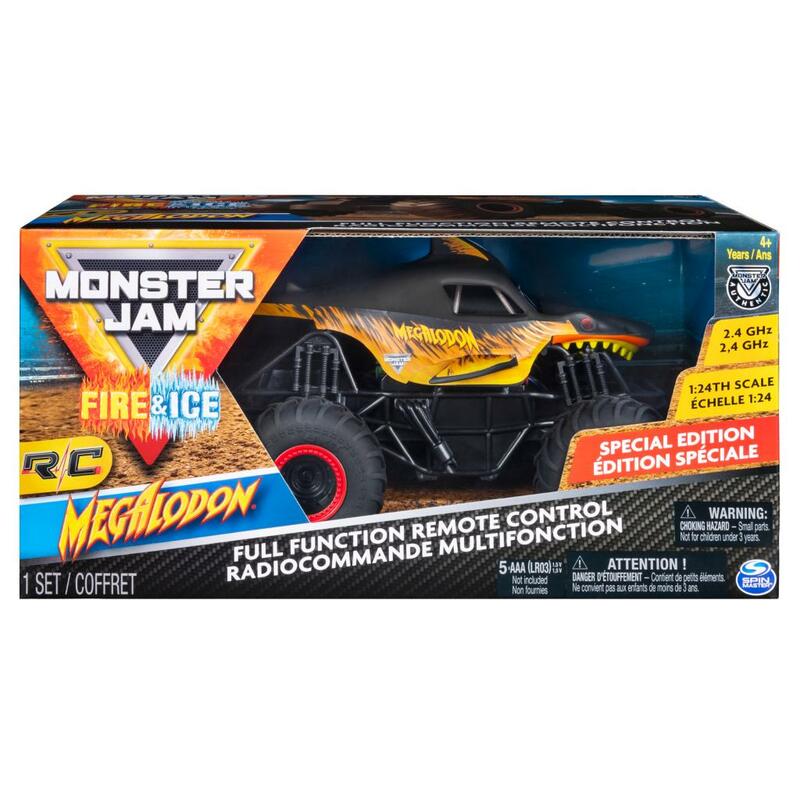 The exclusive, special edition Fire & Ice Megalodon 1:24 scale RC toy is the ultimate gift for kids and Monster Jam fans! Get yours today! Batteries not included. Requires 5 AAA batteries.